2 superior first and second floor flats. 57A three bedrooms, 57B two bedroom. All fixtures fittings & TVs included in sale price. The subject property is situated in the market town of Brigg, which is one of North Lincolnshires largest settlements. Wrawby Street is the main retail area of the town and is also pedestrianised. Wrawby Street contains both national and regional retailers along with Banks and Building Societies which are complemented by a wealth of local traders. To the northern side of the central area is an inner ring road that also provides access to the towns main car park. Access to Wrawby Street from this car park is via numerous pedestrian walkways. The subject property is in a central and prime location within Wrawby Street and therefore at the heart of the retail activity in an excellent trading position. Occupying a mid terrace property over three floors. Constructed to outer elevations of brick beneath a tiled roof. Part of the property is above an archway that provides access to the Exchange Coach House Inn. Access to the flats is via a rear external and partly covered metal staircase. Retail has modern display windows and side single entrance door. The retail area is L shaped with small kitchen and WC. 57A First floor flat, joint entrance, living room with feature tiled hearth, two storage cupboards. Kitchen L shaped with modern high and low level units electric hob. WC with shower area, fully tiled. Bedrooms two doubles and one single. 57B Second floor flat, joint entrance, living room with storage cupboard, kitchen with modern high and low level units, electric hob. WC with bath including shower. Bedrooms two doubles. NOTE the flats have many fine features and are to a good standard of decoration. They are also fitted out to a high standard and all fittings including furniture and TVs are included in the sale price. The ground floor is entered in the rating list as Shop and Premises. Rateable value £5,800 per annum. Flats are Band A council tax. We would recommend that interested parties make their own enquiries to the Rating Authority to verify the current rating liability (01724 296296). 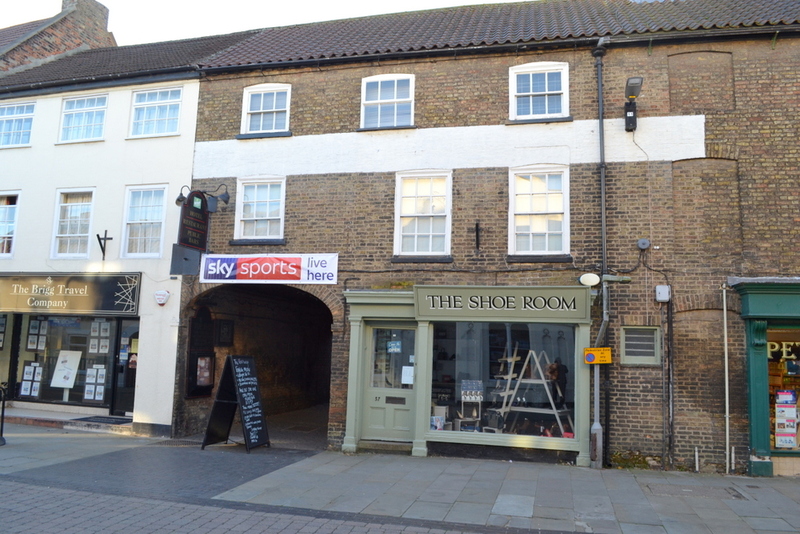 The subject property is being offered freehold with vacant possession given on completion. All fixtures and fittings in the two flats are included within the sale. The property would suit an owner occupier which could then receive an income from the flats or alternatively this could be bought as an investment property where three income streams could be obtained. Viewing is strictly by appointment with the agent. Please contact the Scunthorpe office on 01724 870520 to arrange a viewing. Conditions under which particulars are issued: Fox Knight (Commercial) Ltd trading as Paul Fox Commercial - for themselves and for their vendors or lessors of this property whose agents they are give notice that: i) the particulars are set out as a general outline only for the guidance of the intending purchaser or lessees and do not constitute, or constitute part of an offer or contract; ii) all descriptions, dimensions, references to condition and necessary permissions for use and occupation and other details are given in good faith but without responsibility on the part of the vendor, lessor, Fox Knight (Commercial) Ltd trading as Paul Fox Commercial or their employees. Any intending purchaser or lessee should not rely on them as statements or representations of fact but must satisfy themselves by inspection or otherwise as to the correctness of each of them; iii) no person in the employment of Fox Knight (Commercial) Ltd trading as Paul Fox Commercial, has any authority to make or give representations or warranty whatsoever in relation to the property; iv) all rentals and prices are quoted exclusive of VAT; v) Fox Knight (Commercial) Ltd trading as Paul Fox Commercial will not be liable, in negligence or otherwise for any loss arising from the use of these particulars.